Providing lead generation services for solar installers, Grid Freedom proactively acts as a bridge between the lead partners and solar installers. 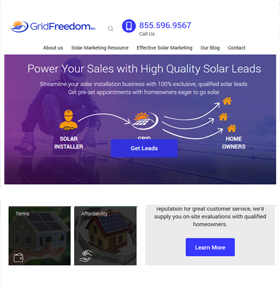 Based in USA and active in the solar industry, Grid Freedom approached us with a redesigning work for their existing website. Our team has always been in favour of delivering a creative piece of work, thus, did a thorough analysis of the project before commencing the work. Once the analysis was done, WordPress developers and ardent designers worked together to set the project in motion and deliver it on time. Making the use of the Bootstrap framework, our designing team made the website responsive for all devices. Furthermore, our developers also rendered a reliable CMS, WordPress, to make the entire process easy and quick. Our designers also created an appealing logo by keeping the nature of business in mind. Google and Facebook ad banners were also designed by the same team. The final delivery was done by us after it went through a rigorous testing phase so that there are no errors in it.